Various industries employ myriad consumables for vacuum operations. These consumables may cost anywhere from a couple of hundreds to lakhs of rupees. This gives rise to the question: Are low cost consumables lesser in importance to high cost ones? Is that the reason why they cost less? What is the cost of an O-ring seal? And what is the total cost of the entire Space Programme? Did anyone imagine even in their wildest dreams that ignoring the quality of such a small product can have such far reaching consequences? Not at that time surely. But after the accident they do! In NASA, now no one takes O-rings lightly. Or for that matter, seemingly low value items. Low in cost, yes, but not low in value! Having made my point, I want to highlight the importance of two low-cost consumables in the vacuum industry: Graphite Foil/Tape and Graphite Suspension/Paste. This is a thin paper-like material with a smooth satin finish. In actuality, it’s not paper but highly compacted graphite that has been cut into rolls for ease of use. 1. 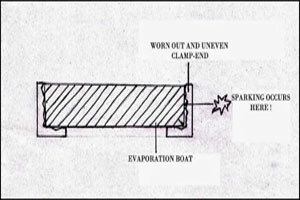 It fills the uneven gaps between the clamp end and the evaporation boat in order to prevent sparking. 2. While filling up the minute gaps it allows electrical current to flow easily from the clamp into the boat in order to heat it up. Doesn’t seem like a big deal. Right? So you think that any ordinary plumber-grade graphite foil can also work here? Right? This seemingly simple and unimportant consumable can cause absolute havoc to the entire vacuum system if chosen badly. 1. Graphite foil meant for vacuum applications should never have even trace amounts of binders or bonding agents like glue, resin or rubber compounds in it. Reason: Under vacuum, these binders (a) release unwanted vapors inside the chamber and affect the vacuum and (b) stick to the substrate, thereby ruining the product quality. 2. Plumber-grade graphite foil may seem smooth in texture but is not compressible enough. 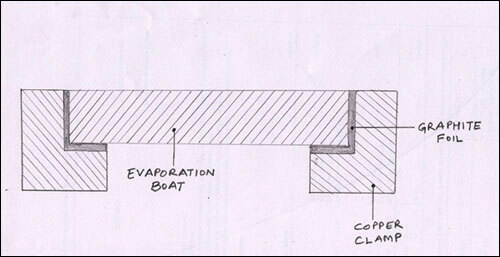 Note: Compressibility is one factor which determines how well the foil will be able to fill the minute gaps existing in between the copper clamp and the evaporation boat. If not filled with foil properly, sparking occurs in these gaps. The more the compressibility, better will be the void fill. Good graphite foil will be highly compressible and will not allow any sparking to take place. 3. 100% purity is an absolute must in graphite foil. Reason: This will ensure that the graphite foil will be high on electrical conductivity and that conductivity will remain constant. If there are impurities the amount of current conduction fluctuates. This causes costly power supply transformers to burn out. 4. The foil should never, under any circumstances, heat up. Resistance to high temperatures is another absolute must for graphite foils. Reason: In the vacuum chamber it may come in contact with molten metals like aluminum etc. Low-grade foil will heat up and burn or melt when subjected to temperatures as high as 1500°c. This can have disastrous consequences in the sense that now Hot Evaporation Boat will come directly in contact with Copper clamp and melt it. This further escalates the damage to Metallizer. 5. High grade graphite foil will always be inert to most molten metals as well as the process gasses. Caution: Presence of binders in low grade graphite foil fails to make them inert, this causes chemical reaction and production of harmful substances. This is another low cost consumable required in vacuum applications. Molten metal inside the vacuum chamber tend to spatter and fall off the evaporation sources and stick to the chamber walls and floor (fig. a). Later it becomes almost impossible to remove the metal globs since they have cooled down and are now firmly stuck to the metal walls of the chamber. In absence of a release agent, operators have to remove these metal globs with a chisel and hammer which is absolutely disastrous for the vacuum chamber walls. But if a layer of release agent is applied to the chamber walls prior to the process, it will not let the molten metal to stick (fig. b). At the time of cleaning, all one has to do is take a clean wet cloth and wipe off the layer of release agent. 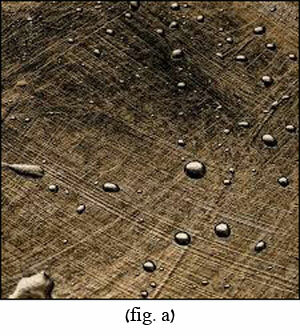 All the metal globs and spatter on top of it, come off like a breeze (fig. c). But don’t let yourself get carried away by the simplicity of the usage. Graphite suspension/Paste, just like graphite foil, needs to be chosen carefully. Its importance is critical too. 1. It should be made with 100% pure graphite powder. Purity of the graphite determines its electrical conductance. Suspension with impure graphite powder lowers its conductivity. 2. It should be water based. 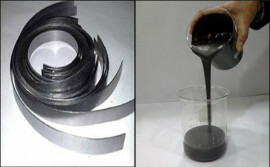 Solvent based graphite suspensions are also available in the market but these are not suitable for vacuum applications. Solvents present in them are (a) flammable (b) release harmful vapors and (c) spoil the substrate quality by adhering to it. 3. 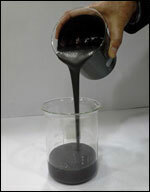 The water used for the production of graphite suspension should be de-mineralized. During the vacuum cycle, water present in the suspension gets released as vapor and is vacuumed out. De-mineralized water is pure and its vapor is harmless for the vacuum process. 4. No harmful chemicals should be present in the suspension. Additives that are used in the suspension to impart a stable colloidal form to it should be of high quality and suitable for vacuum processes. 5. For proper adhesion, it should have superior quality additives in the right proportions. Poor adhesion in the suspension will result in poor quality sticking power. If the suspension will dry and fall off the walls of the chamber / furnace before time, it will prove useless. On the contrary if the suspension sticks to the walls so much that it becomes difficult to take it off at the time of cleaning, it can prove detrimental for the plant. In such a case, the suspension has to be removed with force which harms the plant. 6. It should be non-flammable. Pure graphite is non-flammable by nature. Impurities in it compromise this quality of graphite. Also, if the additives in it are of poor quality, the suspension may catch fire when exposed to molten metals and high temperatures inside the chamber/furnace. This will be nothing short of a catastrophe for a plant! For the sake of cost-reduction, de-mineralized water is not used. Ordinary tap water is used which releases harmful vapors during the vacuum cycle which not only increase the vacuum time but also such vapors adhere to the substrate thereby affecting the product quality. Low-quality graphite suspension/paste use cheap harmful chemicals, additives and bonding agents to bring down the cost of production. Such harmful chemicals corrode the chamber walls. Because of low grade graphite used, conductivity reduces and thus power loss occurs. Poor quality graphite suspension will never have good adherence to the walls. Either the sticking power will be too little or it won’t be easy to take it off the walls. It therefore has to be removed by force which causes problems such as damage to plants and leakages. Harmful chemicals added in cheap graphite suspension/paste to reduce cost attach and damage the O- rings and oil seals in the plant. This starts vacuum leakage problem. For the sake of cost-cutting no engineer will compromise on the quality and safety of the metallizer. So choosing the best quality graphite foil and suspension is of utmost importance. When compared to consumables like aluminum wire or silicone diffusion pump oil these may be low cost items but rate quite high in importance. 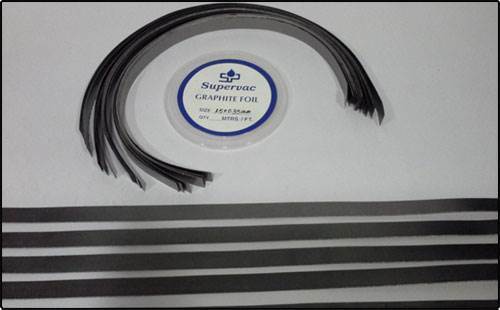 Keeping in mind all these safety and quality parameters, Supervac Industries, India, manufacture graphite foil (SV-GF) in various sizes and graphite suspension/paste (SV-GS) especially for vacuum applications. These products are being used by satisfied customers all over the world.